Welcome to Your High Holidays! High Holidays in Paradise! A family-friendly atmosphere filled with luxurious accommodations, fine food, and inspirational and uplifting services. A place that you will feel the comforts of home while being pampered with the finest amenities. Imagine a High Holiday experience that is as invigorating for your body as it is for your soul. Imagine an experience where you stay in a resort of unparalleled beauty and comfort, which is directly adjacent to a gorgeous new shul known for its stunning furnishings, warm and friendly atmosphere, and meaningful services. Imagine an experience where you enjoy gourmet meals together with your family, as you bask in ocean breezes and enjoy stunning views of the Pacific and the Batiquitos lagoon. Chabad at La Costa, in conjunction with the legendary Omni La Costa Resort, is proud to offer you a High Holiday Retreat that you will be sure to remember. Please feel free to peruse these pages to learn all that we can offer you and your family. The legendary and luxurious Omni La Costa Resort has long been known as a preeminent hotel located in the beautiful city of Carlsbad, California. La Costa has gained its notoriety due to its distinctive architecture, numerous amenities, restful ambiance, impeccable service, and outstanding location. The Omni La Costa Resort is proud to partner with Chabad at La Costa in offering deep discounts off of its normal room rates for guests of Chabad, but the Chabad rate must be mentioned at the time of booking, or can be booked directly by following the link provided below. The hotel and shul properties are directly adjacent to each other, and it is about a 7-12 minute walk between them. To book your room at the special Chabad rate, call toll-free 800-854-5000 or book online at http://www.omnihotels.com/hotels/san-diego-la-costa/meetings/chabad . Traditional, gourmet holiday meals will be offered and are included in the price of the retreat. 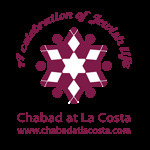 All meals will be served in Chabad at La Costa. In addition to the holiday dinner and lunch, which will be served each day of the holiday, there will also be a continental breakfast, tea room, and prepared hospitality bags (one per room), for all of our guests. All food will be under the supervision of Rabbi Yeruchem Eilfort, Director of Chabad at La Costa and member of the Vaad HaRabonim of San Diego. All meats will be Glatt Kosher, all dairy products will be Cholov Yisroel, all baked items will be Pas Yisroel, and all cooked items will be Bishul Yisroel.